A new experimental add-on for DSLRs brings Lytro-like refocus-able photos to any camera, and tosses in a few extra clever features for good measure. The KaleidoCamera, as it’s called, is a unit that sits between your lens and your camera and performs some clever magic on the light that streams into it. Unlike the Lytro, the KaleidoCamera records its results on your sensor as regular pixels, and you then use software to pick these pixels back part and recombine them in new forms. For instance, the box can use its own sensors to sample the light coming in and record the “plenoptic” information, just like the Lytro. Instead of storing this data, though, it will use it to write up to nine regular images to your camera as a grid of images which can later be used to make images. What does this mean? That you still get to focus your photos after you have taken them. The box will also do other fancy tricks like making HDR images, or separating out the colors in a photo into a spectrum of colors, and then recombining them, thus allowing lots of control over the color of the final image. In short, it’s snapping nine separate pictures of the same scene and communing them later, and it’s all done with mirrors. For an easier example of this kind of manipulation, let’s look at Technicolor, which recorded color movies on B&W film. 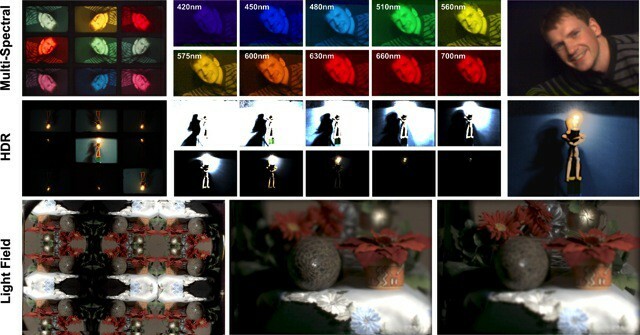 Technicolor uses prisms to split the incoming image into three identical beams. These are each sent through a color filter (one red, one green and one blue) and the result recorded on B&W film. This encodes the three color channels’ brightness values, just like the light coming through the colored filters in from of the pixels on your digital camera’s sensor. Then, once the films were developed, they could be dyed, turning them into separate red, green and blue strips of film. Lay these on top of each other and you have a color film. Magic. And now you know why Technicolor’s colors were so garish – it was down to the dye used to color the films. Because the KaleidoCamera uses the single sensor in your camera to record nine images, these images have to share the pixels, meaning a drop in resolution. Still, that’s a moot point as the KaleidoCamera is still a prototype, and would have to be developed (pun intended) and shrunk to actually make it into production. What really matters is that digital photography is beginning to enable a lot more than just copies of film cameras and fake computer-generated light leaks.